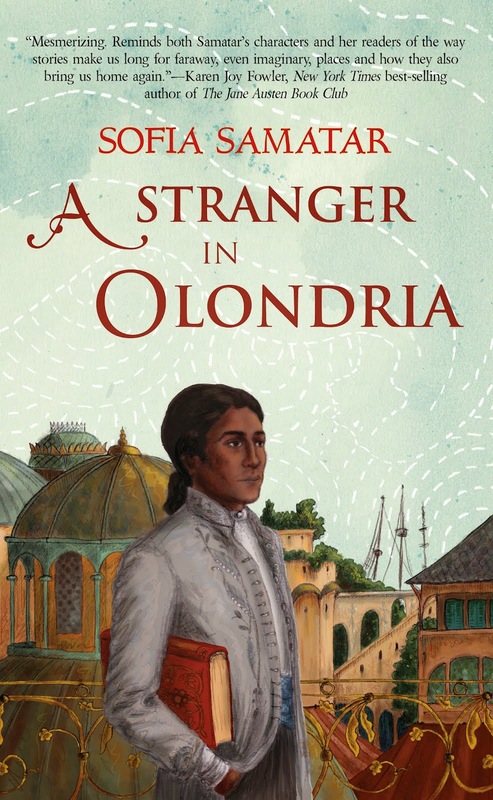 Oh my goodness, "A Stranger in Olondria" (2013). I was unprepared for how this book was going to sweep me away. Indeed, I reverted to a reading pattern from my youth that I haven't done in a long time: I simply devoured the book in a few sittings over a day or two, then immediately went back to the beginning and read it more slowly. Sofia Samatar's first full-length novel and most recent winner of the World Fantasy Award, "Stranger" is a very unusual fantasy. At a plot level, it's unusual, though not terribly complex--a wealthy young man visits a much larger and cosmopolitan nation, is haunted by a ghost (which has religious/political ramifications), goes through a lot to be exorcised, goes home. The texture, details, and themes of the story, though, are incredibly rich, and I can already tell this is a book I'll be revisiting a lot. We started the meeting by going around the circle and giving some quick impressions. Gremlin also brought Nic Clarke's Strange Horizons review for some discussion points. Style was the main feature of our comments both positive and negative. Some of us loved the rich, verbose descriptions, while others found the ratio of setting to plot too high. I believe the specific line was "enough with the trees and bushes already!" We were moving away from the sea. On our left hung high limestone cliffs, topped with turf and a few wind-blasted trees; on our right the country spilled like a bolt of silk unrolled in a market, like perfumed oil poured out in a flagrant gesture. The Ethendria Road, wide and well-kept, curved down into the Valley, into the shadow of the cliffs and the redolence of wet herbs. The grape harvest was ended, and the country was filled with tumbled vines, rust-colored, mellowed with age, birdsong, and repose...Everything shone in that sumptuous light which is called "the breath of angels": the hills flecked with the gold of the autumn crocus, the windy, bronze-limbed chestnut trees and the radhui, the peasant houses, sprawling structures topped with blackened chimneys. The trees and roofs stood out precisely against the purity of the sky whose vibrant blue was a unique gift of the autumn. The dust sparkled over the road, and its odor mixed with the wilder scents of smoke and grasses in the deep places of the fields. Day was opening in the sky, and they saw that the mountains were now much further off, receding eastward in a long curve that was lost in the distance. Before them, as they turned west, gentle slopes ran down into dim hazes far below. All about them were small woods of resinous trees, fir and cedar and cypress, and other kinds unknown in the Shire, with wide glades among them; and everywhere there was a wealth of sweet-smelling herbs and shrubs. The long journey from Rivendell had brought them far south of their own land, but not until now in this more sheltered region had the hobbits felt the change of clime. Here Spring was already busy about them: fronds pierced moss and mould, larches were green-fingered, small flowers were opening in the turf, birds were singing. Ithilien, the garden of Gondor now desolate kept still a disheveled dryad loveliness. Elsewhere, however, Samatar's descriptive language extends in directions we never see in Tolkien--the intoxicated feeling of loving a new city, trying to describe a rich, varied, elaborate population. Last note of Tolkien comparison--I would say Samatar's writing is much more embodied, less epic, closer to home--thinking particularly of Jissavet's description of her childhood. There's a quality of internality, not merely of being first-person, but of articulating what it's like to be there, in that place, feeling what the character feels, that Samatar achieves in a way one doesn't often see in fantasy. Something I noticed while reading "Olondria" is the frequent and vivid use of scent. Most novels (that I read, anyway), tend to privilege visual descriptions first, with sound a distant second and all the other senses--scent, taste, all the varieties of touch & proprioception--trailing far behind. There are solid biological/pragmatic reasons for that privileging; humans area a strongly visual species, neurologically, and it's much easier to describe something novel, imaginary, or strange in terms of its visual (or sometimes aural) properties than in terms of olfactory or gustatory traits. Indeed, it can be difficult to talk about the scent/taste qualities of a food that both you and your audience eat routinely in any meaningful way, other than just referring to it by name and hoping you have a shared memory of it. Tasting and talking about coffee for a living, and interested in the mechanics of expressive fiction writing, I think about this pretty frequently. I don't know the neuroscience enough to claim to be anything like an authority, but there's definitely some correlation between where our language centers are located--close proximity to visual/auditory processing, far from scent/taste--and the ease with which we can talk about things. Scent processing is closely tied to structures associated with memory and emotion, however, which I think fits well with how scent can "take you back" more effectively than visual imagery. Neurology aside, I also think there are some structural barriers to talking about "new" scents. Sight has abstract & spatial qualities that allow it to be translated easily--I could easily describe, over the telephone, the visual description of a building/shoe/tree/whatever that my listener has never seen before, and they could get a reasonably accurate mental picture. While not as spacial, sound has more of a vocabulary associated with it, and internal structures that make it easier to talk about (loudness, tone, rhythm, etc.). But imagine trying to describe cinnamon in words alone to someone who's never smelled it. Scent and language exist on more of a one-to-one: the perception of a scent almost always corresponds to a specific molecule (or a particular combination), without experience of which it's difficult, perhaps impossible, to imagine (and note the etymological visual prejudice even in the word "imagine"). So yeah, we talked about style, verbosity and vocabulary. A strength of this novel, but if it fails to woo you it will definitely be a tough read. 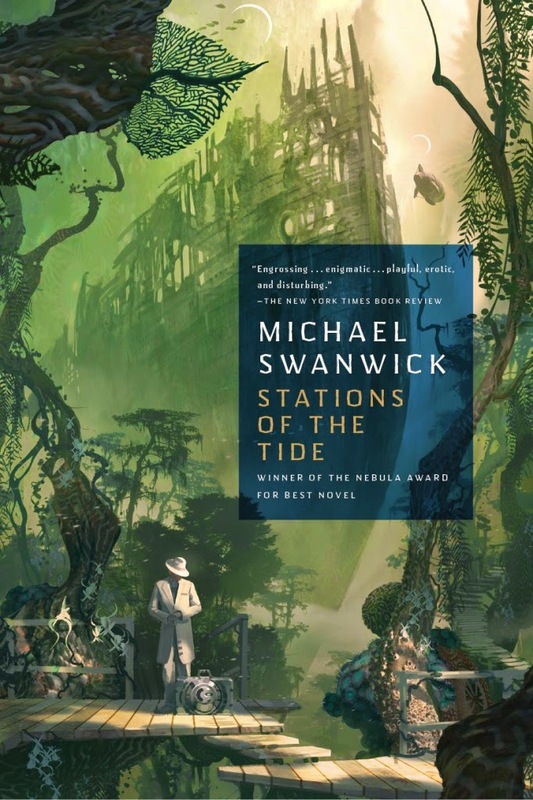 Something we really liked and commented on is the way that stylistic shifts within the novel are used to signal narrative changes--there's a lot of stories-within-stories here--and mood, the best example of which is when Jevick, our narrator, wakes up after essentially a bender. The language, which had been exuberant, florid, run-on, is suddenly spare: "I awoke to glare and silence". This marks a major turning point in the book, with the naive enthusiasm of Jevick suddenly tempered and new themes of both decadence and desolation entering the text. Think Galactic's Word of the Day courtesy "Olondria", by the way, is marmoreal: like or relating to marble. Not gonna forget that one, now. OMG I love this new cover. We particularly enjoyed some of the stories that were more clearly in a mythic mode--the doomed lovers who never saw each other face to face, the adventurer who married a shape-shifting dolphin. Is there a word for that specific type of myth--where going against one's lover's prohibition reveals them for a shapeshifter, and reverts them to their animal type? Colin Meloy being perhaps the modern bard of this archetype: "The Crane Wife" (2006) and "The Hazards of Love" (2009). We liked and were intrigued by repeated motifs of sickness and disability, starting with Jevick's older brother and the notion that on their island there is a tradition--not one followed by everyone, but there--that people with severe mental disabilities are some species of sacred. There's a sinister echo of this in the Olondrian Avalei cult's reverence for the angel-haunted, which may amount to a refusal to treat a crippling and painful condition for religious reasons. Weakness and injury are major themes, and the angel's tale--maybe the most powerful section of the book--all revolves around a progressive, hereditary, degenerative disease. That line of Jissavet's really shook me: "This life in which I have nothing, only this illness, huge, inscrutable, this illness which has slowly become myself." I don't often find things hard to read for emotional reasons, but Jissavet's story strikes close to home for me. Because DEATH. A lot of this book has to do with death in various ways, particularly the ways that reading and writing can connect us to the dead. Avalei, whose followers' reverence for angels brings them to free Jevick from the institution where he has been hospitalized, is the goddess of Love and Death (so emo!). Books and reading are characterized as ways to "commune with the dead"; Jevick's tutor, who teaches him to read and passes on his love of literature, has "sad, necromantic eyes". Last and largest, the angel Jissavet's relationship with Jevick revolves around writing as a way for her to reclaim her life in some fashion, to ensure that some of her being lives on even though her life ended so early. We liked the worldbuilding a lot in "Olondria", and talked about it a fair bit. There were some concerns about how well the maps work relative to the narrative--we had some questions about map scale compared to how long we're told it takes to get from place to place (time travel around Tyom, for instance, or Jevick's heavily-burdened flight to the desert). Think Galactic: "We Care About Your Fictional Maps". Something I really enjoyed about the worldbuilding here is that Samatar has crafted very detail-rich cultures that aren't straightforward transposition of existing or historical societies, which is quite a feat. One can recognize some sources and inspirations for the various religions and cultural details, but it's not a case of "culture X but with Y fictional complications" which one often sees. Other than the angel phenomena, the possibly-divinely-gifted Stone, and the extremely brief mention of war-birds big enough to ride, there's nothing "fantastic" in and of itself here. The technology level is a little hard to peg--late Renaissance, early Enlightenment? Sailing ships, printing presses--and the narrative focus on stories, literature, and personal journeys, coupled with the fact that our viewpoint character is an outsider not very well-informed of politics or larger cultural reality, so despite the rich and easy-to-visualize immediate scenes we find ourselves in, I don't have a very clear "big picture" of this world. Which doesn't particularly bother me for this novel; but I do want to know more about the religions of Olondria. We talked for a bit trying to suss out the deal with the "Stone" religion versus the Avalei cult. Though not expressed as monotheistic, the Stone ideology does seem to rely on written instructions directly from a god/gods, with a single correct interpretation (monosemantic?) in a way that reminded us of the text-based Abrahamic religions supplanting more diverse and less literate traditions. 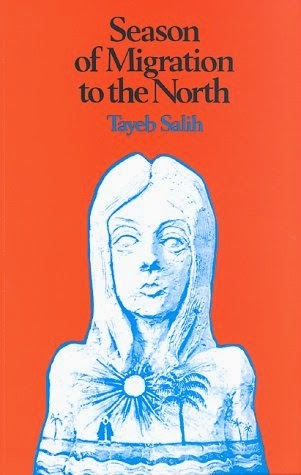 The conflict between the Stone & Avalei cults is expressed in the novel as being between written and aural/oral modes of experience (and perhaps between fixed and floating control of meaning, which doesn't really map that cleanly to the written vs. spoken dichotomy), but how exactly the written word is oppressing/erasing pre-literate traditions is not made very clear. Certainly not so clear that I am on board with the Avalei uprising's goal of burning the libraries. I would have liked to see a teensy bit more exposition on what exactly is going on in this conflict. Reading and talking about this aspect got me thinking about "in-world real" vs. "in-world fictional", particularly as regards to religion. A lot of fantasy tends to work in an all-or-nothing fashion with regards to the (in-world) truth of supernatural claims. I can't think of a good example off-hand, for instance, of a work that includes both (in-world) real and (in-world) false gods or magic. Here in "Olondria", Samatar plays around with that a bit by leaving us in the dark about both what most Olondrians believe (we only get Jevick's limited perspective) and what the actual truth is regarding those beliefs. Other than the angel/ghost Jissavet (who, it must be said, only communicates with Jevick, and doesn't otherwise interact with the world of the living), there's no evidence in the novel for anything else supernatural. Laini Taylor's "Daughter of Smoke and Bone" trilogy (2011-2014). Philip Pullman's "His Dark Materials" trilogy (1995-2000). Robin LaFever's "Grave Mercy" (2012). Nick Cave and the Bad Seeds' album "Murder Ballads" (1996)? I was struck by, and proceeded to reach too far to make something of, the Olondrians' mispronunciation of Jevick's name to "Shevick", which of course echoes "Shevek", protagonist of Ursula Le Guin's "The Dispossessed" (1974), a book-smart but often naive traveler from an impoverished land (Anarres/Tea Islands) to a rich, decadent, troubled one (Urras/Olondria), whose major accomplishment is enabling communication between worlds (the ansible/Jissavet's vallon). Reaching much? Perhaps. Someone at group said that Samatar has referenced Le Guin (along with Tolkien and Mervyn Peake) as a major influence. Also funny because last month's Think Galactic, Cherryh's "40,000 in Gehenna" (1983), includes a character whose name may be a reference to Genly Ai from Le Guin's "The Left Hand of Darkness" (1969)--a male ambassador and anthropologist in a work much concerned with gender. But I digress. The silence. End of all poetry, all romances. Earlier, frightened, you began to have some intimation of it: so many pages had been turned, the book was so heavy in one hand, so light in the other, thinning toward the end. Still, you consoled yourself. You were not quite at the end of the story, at that terrible blank flyleaf, blank like a shuttered window: there were still a few pages under your thumb, still to be sought and treasured. Oh, was it possible to read more slowly?--No. The end approached, inexorable, at the same measured pace. The last page, the last of the shining words! And there--the end of the book. The hard cover which, when you turn it, gives you only this leather stamped with old roses and shields. Then the silence comes, like the absence of sound at the end of the world. You look up. It's a room in an old house. Or perhaps it's a seat in a garden, or even a square; perhaps you've been reading outside and you suddenly see carriages going by. Life comes back, the shadows of leaves. Someone comes to ask what you will have for dinner, or two small boys run past you, wildly shouting; or else it's merely a breeze blowing a curtain, the white unfurling into a room, brushing the papers on a desk. It is the sound of the world. But to you, the reader, it is only a silence, untenanted and desolate. This is the grief that comes when we are abandoned by the angels: silence, in every direction, irrevocable. Instant winner of the "Jake Casella Award for Passage that made me Clutch My Heart and Maybe Scream a Little". That interweaving of what it's like to be a passionate reader with the earlier theme of losing a loved one, ayeiee. 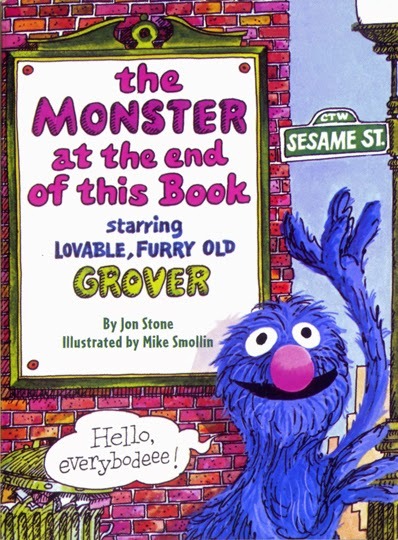 However, I can't help pointing out that this passage is structurally identical to that other work of mortal fear, anticipation, and meta-literature: Jon Stone & Mike Smollin's 1971 masterpiece "The Monster at the End of this Book: Starring Lovable, Furry Old Grover". Which you can read online, it turns out. And with that, I leave you. Think Galactic's next meeting will be to discuss Alaya Dawn Johnson's "The Summer Prince", Thursday, April 9th, 7:30pm at Myopic Books.